zoom in on Maggie. omg, even when she is throwing a tantrum, I just love her. Can I just tell you how perfectly this captures everything about our pumpkin patch efforts? she was such a big girl getting her face painted. not scared at all and knew just what she wanted. this owl. so cool. I love the Ladybird Johnson Wildflower Center. They also had bats. So freaking cool. holding hands. melt my heart, these two. gymnastics had a dress up class. 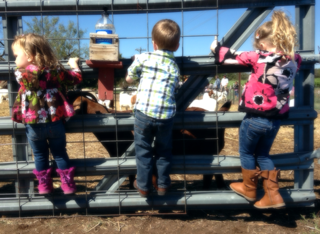 petting zoo at the pumpkin patch with their friend Liam. (the girls thought they were butterfly princesses.